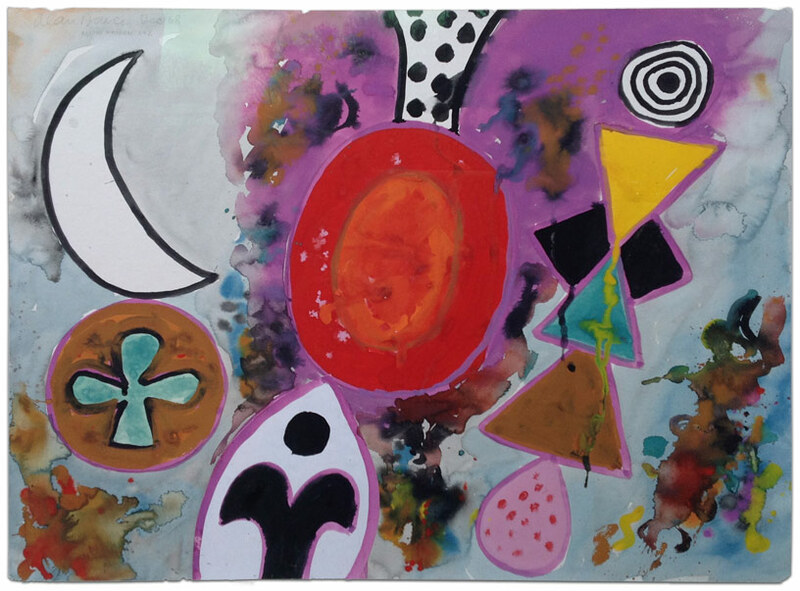 The work of Alan Davie (1921-2014) was highly acclaimed during his life time and was frequently referred to as Scotland’s greatest contemporary artist. In 1967 Alan Bowness, a future Director of the Tate Gallery, said ‘Davie is among the major figures in the art of our time’ and his obituary The Daily Telegraph described him as ‘a superstar of British art, feted by Pollock, Rothko and Hockney.’ Encouraged by the likes of these artists, he had his first show in the US in New York in 1956 which was a sell out, with most of his pieces going to major institutions like MoMA. Davie was a man of many interests, all of which influenced him. His love of colour was matched by his love of music; he had been a professional jazz musician, a talented pianist and great admirer of Bach. He spent long periods in the Caribbean and was fascinated by African and Pacific cultures, the signs and symbols of the Celts, Picts, Egyptians, Navajo Indians and Australian Aboriginies all of which he blended together with Zen Buddhism, mythology, magic and village folklore to achieve his highly individual abstract work which has been regarded as ‘apocalyptic and triumphant’.